Ritz Carlton, Dubai, previously a winner of FTF’s Top 10 Getaways for Tiny Travelers award in the “Best International Beach Resort” category, gets a fresh look in 2016. Enjoyed by European and Asian business travelers with families, Dubai is a modern Arab city-state whose fascinating culture flavors all it has to offer, including world-class beaches, desert safaris, sporting opportunities, and shopping at souks, the traditional markets for exotic spices, teas, jewelry and carpets. Dubai’s economy has prospered by shifting from oil towards tourism as a cruise line port-of-call, busiest between September and May (summer can be extremely hot.) In keeping with local tradition, visitors are asked to dress modestly and all children are cherished. Ritz Carlton Dubai facilities include 294 rooms and suites, all with balconies and sweeping views, five swimming pools (including two shaded kid’s pools/water slides), tennis center and squash courts, fitness center, aerobics studio, watersports, six restaurants and a spa providing Oriental and Far Eastern therapeutic techniques. “Protect Our Little Ones,” a hotel room safety program for guests with children under 5 years originated in Dubai. Childproofing items including a night light, tub spout cover, outlet plugs and first aid kit are placed in the rooms. Kids receive a welcome kit with stickers and coloring pages, cookies and marshmallows in the room, and bathroom amenities. 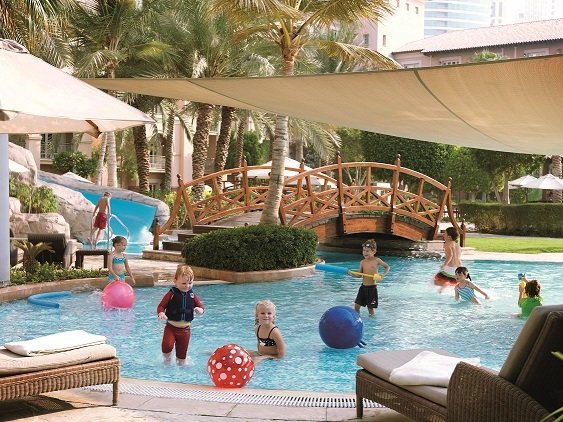 The Ritz Kids Club offers daily complimentary activities in a bright and secure playroom from 9am to 6pm. Activities include arts’n’crafts, games, puzzles and stories. Outdoors activities take place in the pool and on beach walks. Kids two-hour long Specialty Courses such as Origami Arts and Jr. Lifeguard are available for a fee and advanced booking is required. For parents who want to share a romantic dinner, evening care is available on Thursday and Fridays from 6pm to 10pm for a fee. Individual babysitting can be arranged through the hotel. In association with Jean-Michel Cousteau’s Ocean Future’s Society, on-site activities and learning experiences are offered to kids ages 4- to 12-years old. Jean-Michel Cousteau says, “All kids start out as scientists, constantly asking ‘Why? What’s that? 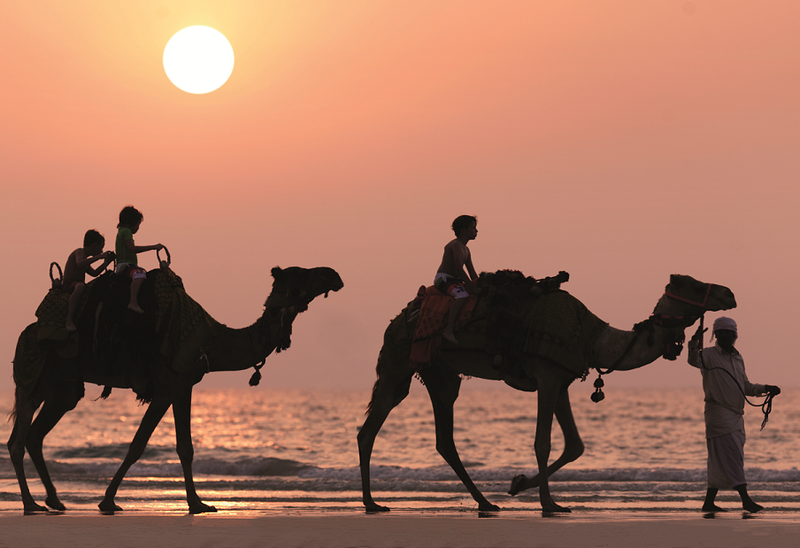 How does it work?’” Ritz Kids resort experiences tap into that innate curiosity by introducing young guests to both the natural wonders of the Arabian Sea, and the rich cultural traditions of the region. Immersive and adventurous resort activities provide children with a rich variety of beach experiences that attract many European families. With diverse programming based on the four pillars of the program – water, land, environmental responsibility and culture – kids are swept away by everything from coral reefs and forests, to recycling and sustainability, storytelling, art and even food. The Ritz Carlton Dubai International Financial Centre (see the review here) is a city hotel that welcomes expat families as long stay guests, business travelers, and those passing through on a quick layover. 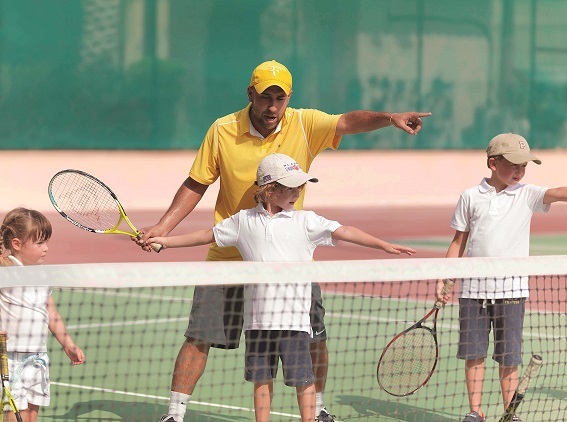 The Ritz Carlton DIFC offers “Ritz Kids” a special kid’s registration area, welcome packet with coloring book, and a hotel-wide scavenger hunt. 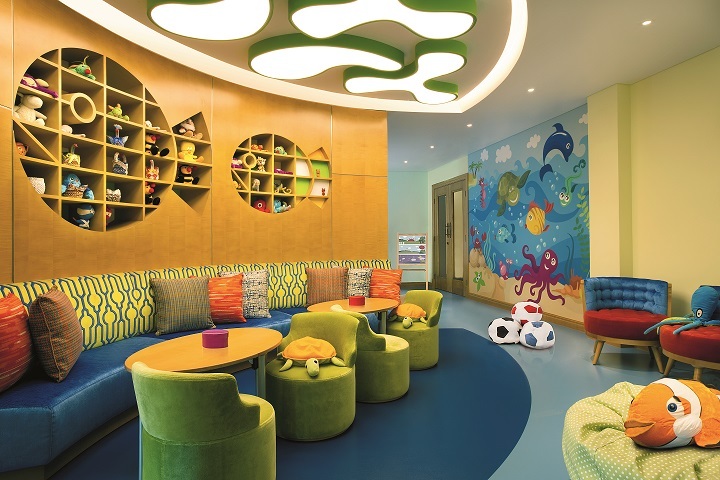 Kids find a welcome toy and food amenity in the room and enjoy a special menu in the hotel’s two restaurants.